Miriam “Merch” Cohen, 96, of Lewistown, entered into eternal rest on Friday, Sept. 7, 2018, at Ohesson Manor. Born on Aug. 30, 1922, in Rochester, N.Y., she was the daughter of the late Abraham and Sarah (Gaffin) Brown. Merch was proceeded in death by: her husband of 74 years, David; six brothers; five sister; and grandson, Benjamin Rush. Merch is survived by: her children, Linda McKeever, of York, Phyllis Johnson and husband, James, of Lewistown, Arna Rush and husband, and Timothy, of Newport; grandchildren, Jeffrey Johnson, of Yeagertown, Daniel Johnson, of Jersey City, N.J., and Leah Keilman and husband, Scott, of Newport; and great-grandchildren, Pandora and Cheyenne Johnson, Tova, Hendrick and Bellamy Keilman, Elli Rush and Lynzee Navarria and husband, Michael. Merch devoted her life to being a loving wife, mother and homemaker. As the youngest of 12 children, she grew up with a large extended family with which she remained close all of her life. Her love of family included her husband’s large extended family and she shared her appreciation of family with her children and their children. Family gatherings will always be remembered as times of affection, reminiscences and laughter, with Merch often at the center of the fun. 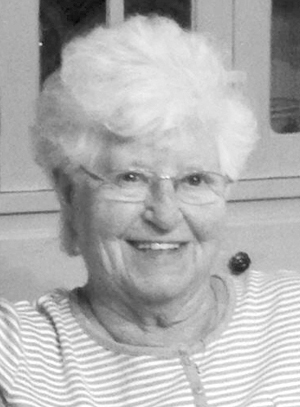 Merch was an avid bowler earlier in her life, but later became an enthusiastic golfer, a sport she was able to share with her husband and daughters. Merch was a wonderful wife and mother and a good friend to many. She was kind to all she met and her gentle and fun-loving nature will be forever missed by family and friends. Her funeral service will be held at 1 p.m., Wednesday, Sept. 12, 2018, at Barr Funeral Home, 120 Logan St., Lewistown, with Rabbi Jeffrey Astrachan ofiiciating. Interment following the service will be at Ohev Shalom Cemetery. In keeping with Jewish tradition, the family will also observe a period of Shiva after the funeral when friends and family may continue to make condolence visits. Shiva will be held from noon to 3 p.m., Thursday, Sept. 13, 2018 and Friday, Sept. 14, 2018, at the home of Phyllis and James Johnson at 827 Middle Road, Lewistown. In lieu of flowers, the family suggests memorial contributions be made to a charity of your own choosing.